between birth and six years old. your children will become readers. your child will learn that print makes sense. books will become a part of your child's life. 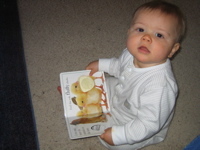 At four months, my infant grandson, Noah, is “reading”. He has reading behaviors that include looking at pictures, holding the book, turning the pages, vocalizing as I read, and becoming engaged with characters. But, he needs more if his first grade teacher is going to help him become a reader. First, he needs a large vocabulary to make educated guesses about the print in books. Vocabulary is developed by talking, playing, and reading with children. Conversations about the the child’s place in the world can happen in cars, over breakfast, in bed. Play the “whassat?” game. The child points, you answer. Next, he needs experiences. Sitting and doing nothing, means learning nothing. Watching TV and computer games is doing nothing. Go to the grocery store, play at the park, plant seeds, make snowballs, roll in leaves, load the dishwasher, play with toys, frost cookies, crack eggs, take bubble baths... The list is unending. Each experience creates a niche in the brain for information to find a home. The world needs to make sense for him to learn to read, “I went for a ride on my house,” does not make sense. If he is always second guessing when dinner is, where the coat is kept, and worse, where he is going to sleep tonight, he will not trust that the world of print makes sense. Noah needs a vivid and active imagination. 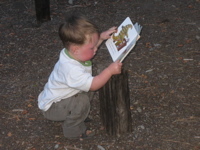 Imagination is developed during play and reading. Children need to be children. That is their job, play is their work. 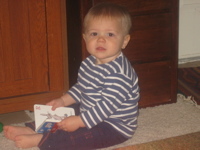 Get out the blocks, toys, and marble chutes. Children gain an “I can do it” attitude while learning how to share, converse, compromise, lead, follow, and govern without adult intervention. He needs to play with sounds. Da-da-da becomes Daddy when he is encouraged to babble. More important, da-da-da must be implanted in his brain. It, along with other isolated sounds, make up the words of a child’s native language. He needs endless hours of the imitation game. Babble when he babbles, make raspberries when he makes raspberries. Funny thing, when I say, “I love you,” he turns the imitation game around. Finally, he needs a long attention span... free of TV. Watching hours of TV does not mean your child has a long attention span. Rather, it means his brain is hypnotized, asleep. A long attention span comes from digging in the sand box, building with blocks, making mud pies, looking at books, or endlessly playing the peek-a-boo game. So, you see, Noah’s teacher will not teach him to read. The work will all be done by his mama and daddy.